"My family requests that I make these cupcakes every time I come home. For all lemon lovers!" Beat lemon cake mix, water, vegetable oil, and eggs in a large bowl for 2 minutes. Spoon batter into the prepared muffin cups, filling them about 2/3 full. Bake cupcakes in the preheated oven until very lightly browned and a toothpick inserted into the middle of a cupcake comes out clean, 18 to 22 minutes. Cool cupcakes thoroughly. Cut vegetable shortening and 1/4 cup butter together in a bowl with a pastry cutter until well mixed. Beat lemon juice into shortening mixture until creamy. Stir 2 cups confectioners' sugar into shortening mixture, about 1/2 cup at a time, until the filling is smooth. Set filling aside. Place white chocolate into a microwave-safe bowl; heat in microwave on High for 15 seconds and stir chocolate. Continue heating in 15-second intervals, stirring between heating until white chocolate is melted and smooth. For frosting, beat cream cheese and 1/2 cup butter together in a bowl until smooth and creamy. Stir in melted white chocolate and vanilla extract. Gradually beat in 4 cups confectioners' sugar, alternating with drizzles of orange juice, to make a smooth and creamy frosting. Cut holes through the top of each cupcake. Holes should be deep enough to put filling inside. Spoon lemon filling into the holes. 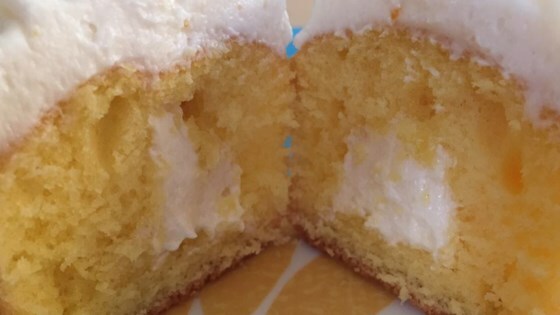 Pipe the cream cheese frosting on top of cupcakes; sprinkle with lemon zest. I made these for a bridal shower and everyone LOVED them. I did add a little lemon zest in the frosting rather then just the top. I topped them with crushed up lemon head candy. I made these for a family get together and everyone loved them! I wouldn't make any changes.